Pasta! Almost everyone loves pasta, from Linguine with Clam Sauce to Spaghetti and Meatballs, from Pasta Primavera to Meat Lasagna. Pasta is a staple in the diets of many for its versatility, ability to fill our bellies, and its relative inexpensive nature. But do you really know how to cook, sauce and serve pasta properly? Preparing pasta dishes right actually isn't as simple as tossing dried noodles into a pot of boiling water. I'll admit I may be a bit of a pasta snob. My heritage is (half-)Italian and I've traveled to Italy several times, where I've enjoyed some of the best pasta dishes of my lifetime. I'm also a passionate home cook and especially particular with how I prepare any pasta dishes. In this article, I'll address some of the common errors I've seen made in cooking pasta - don't worry, I've made a few of them in the past myself before knowing better! These mistakes are easy to correct and in no time you'll be "doing pasta right" - and pleasing your family and dinner guests with your pasta expertise. All photos on this page are by the author, sockii, unless otherwise indicated. Are You a Pasta Expert or Novice? I am the Iron Chef of pasta cookery. You should kneel before me in awe. I know my pasta and I know how to cook it. However, I'm always interested in learning more to improve my skills. I think I'm pretty good at cooking pasta, but now you've made me nervous. The extent of my pasta knowledge is throwing some Ronzoni in a pot and opening a jar of Ragu. Stop calling it pasta, darn it! It's macaroni! If you don't begin your recipes with the best ingredients, you can't expect the best results. The best dried pasta is made from Semolina flour. If you use inferior-grade pasta, such as a supermarket discount variety, you can't expect the same fine quality results. I always stick with quality imported dried pasta from Italy. Check the label to be sure it says "Semolina" or pasta di semola di grano duro. Of course, some with dietary restrictions and allergies may find that rice-flour pasta, farro-based pasta, and other specialty varieties better suit their lifestyle. Each of these different varieties of pasta can require their own specific techniques for proper preparation, as do fresh pasta noodles; here, I will be focusing primarily on dried Semolina pasta. Pasta comes in many different shapes, cuts and styles for a reason far beyond appearance. Different shapes of pasta best suit different styles of cooking and different sauces. Thin, light and slippery sauces, like those made from white wine, olive oil and shellfish, do best with long noodles such as spaghetti, linguine or angel hair (for especially delicate sauces). Thick and chunky sauces like a Primavera or legume-based sauce do best with shapes such as shells, penne and farfalle. Pesto and other dense, herb-based sauces cling and make for hearty pairings with twisted, thick shapes such as Strozapretti. Experiment with different pasta shapes and find which ones work best with the sauces you regularly enjoy preparing. But don't simply grab whatever you've got handy in the cupboard; think about pairing your sauce with your pasta, just as you'd think about pairing a wine with your entree of choice. Cook Pasta in Plenty of Water! Generally you should be using a pot capable of holding 5 quarts of water to cook 1 pound of dried pasta. A lightweight aluminum or metal pot is ideal as it will conduct heat quickly and evenly - and is also lightweight to lift when ready to drain! A stock pot that is taller than it is wide will also work well in most cases. Remember, you want to be able to fill the pot up with enough water to cover the noodles, without having the water boil over. Need a good pasta pot? DO Salt Your Pasta Water! People are very conscious of salt consumption these days - perhaps far TOO conscious. Pasta water should always be salted, otherwise your final dish is sure to taste bland, no matter how spicy or rich a sauce you add to it. Additionally, if you add your salt only at the very end of cooking time, before serving, all you will taste is the salt because it hasn't had time to blend and merge with the other ingredients. Coarse grain or Kosher salt is the best, and you should add 1-2 tablespoons of salt. Yes, that much. Just as pictured to the right. The salt should be added to the cooking water several minutes before the pasta to ensure it has time to dissolve in the water. Don't Add Olive Oil to Your Pasta Water! One of the biggest myths - and actual tragedies - of pasta cookery is the idea that you should add olive oil to your pasta cooking water. Absolutely not! People say adding olive oil keeps the pasta noodles from sticking to each other. That might be the case, but it also prevents the sauce from clinging to the noodles as it should when finally served! If you don't want your pasta to stick together, be sure to use high quality dry pasta to begin with, stir it regularly while cooking, and do not over-cook it. As soon as the pasta is done (and indeed, when still "al dente" or firm to the tooth), you should drain it and immediately toss it with your sauce. Olive oil can be added before plating, if necessary, to enrich the flavor or thin the sauce. But adding the oil to your boiling pasta water is NEVER a good idea! Finally on the subject of olive oil - DO us good quality olive oil, not just some bargain variety sold in a giant can at the supermarket. Keep a variety of olive oils on hand and learn how some can have a peppery flavor, others a fruity note, and which ones work best in accenting which kinds of pasta sauces. As mentioned above, the best way to make sure your pasta is not sticky and is well-mixed with your sauce is to do the mixing in the kitchen, before plating and serving. Don't just drop pasta onto serving plates and spoon sauce on top of it! Often the best thing to do is finish cooking your sauce on the stove top once the pasta noodles have been added, perhaps while just slightly "under"-done. This will ensure the sauce and noodles are well mixed, and that the seasoning of the sauce is correct because you'll have a chance to taste it in the kitchen before plating. If your sauce seems too thick or dry, this is when you can add a little extra olive oil, butter, or even a small amount of reserved water from when you cooked your pasta noodles. Use these additions sparingly and with care, so that the pasta is not swimming in oil or water when served. This problem is one I have with how many Italian-American restaurants choose to serve pasta in the United States. Pasta is meant to be combined with an appropriate amount of sauce, not swimming or drowning in it. The purpose of the sauce is not to drown out the flavor and texture of the pasta but to complement it. Dress the pasta in enough sauce to coat all noodles when tossed, but there should not be giant mounds of sauce sitting on top of the plate, or pooling around the pasta bowl edges. Worst yet is pasta turned into a congealed, solid mass from being combined with too much Alfredo or other style of cheesy cream sauce. Gross! Enjoy Pasta in Healthy Moderation! 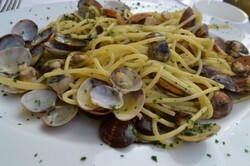 Pasta has earned a bad reputation in many diet plans, yet for centuries it has been a staple of the Mediterranean lifestyle. The thing to remember if you are health conscious is that Italians do not eat pasta to excess the way we tend to in the United States and other Western countries; pasta is served as a modest "first course" or side dish to a reasonable piece of meat or protein, not often a meal in and of itself. We have it ingrained in our mentality these days, based on restaurant chains such as Olive Garden or Buca Di Peppo, that if we don't have a pound of pasta noodles on our plate, we are getting a "small" or "stingy" portion. This is simply a matter of massive portion distortion. A modest-sized bowl of pasta with fresh sauce can make for a filling and very healthy lunch. Pasta served at dinner time can make an excellent side dish or light meal, but too much pasta can leave you feeling bloated and sleepy. Enjoy pasta in moderation as with all foods, and it can provide a good carbohydrate for our diets that provides much energy and satisfaction. One thing I've done is blanch broccoli in the water I'm boiling to cook my pasta - that even adds some of the flavor to the water! But yes, broccoli makes a great and healthy base for a sauce, like a pesto, but with all of that extra nutrients. Nice article. I wondered why you shouldn't add oil to boiling pasta. What you say makes sense. I also like your suggestion of broccoli paste. I often add broccoli to my pasta: steam it and then add it to the sauce. I will try broccoli paste too.